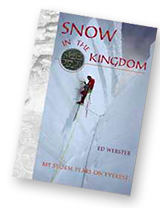 Snow in the Kingdom is the bitter and heroic autobiographical saga of Ed Webster's five "Storm Years" on and off of Everest. The thrilling account of the smallest team to climb a major new route up Mount Everest - only 4 climbers, no bottled oxygen, no radios, and no Sherpa assistance - up Mt. Everest's Kangshung Face in Tibet. Description: 6 x 9.25 inches, hard back, color laminated dust jacket, 580 pages, 150 pages of beautiful color photographs, and 282 black and white photos. Plus maps of Asia and the Tibetan Plateau, 3 climbing route maps of Everest's three faces, and 8 detailed and up-to-date Everest climbing route photo-diagrams. Limited Signed Team ($75 plus P&H) and Limited Signed Deluxe ($600 plus P&H) special numbered editions are also available. See Limited Edition Book Info above, in "Explore this Website."